Photo of Pyrus communis L.
Deciduous tree of the Rose family -rosaceae-, up to 10 m. Grey erect trunk, with its bark breaking into stripes. Ovate leaves till 10 cm, bright green above, glabrous. White or rosy flowers, till 1,5 cm wide, gathered in corymbs from 3 to 7. The fruit is an edible pome. It appears as a cultivated tree in Europe, North of Africa and Asia. 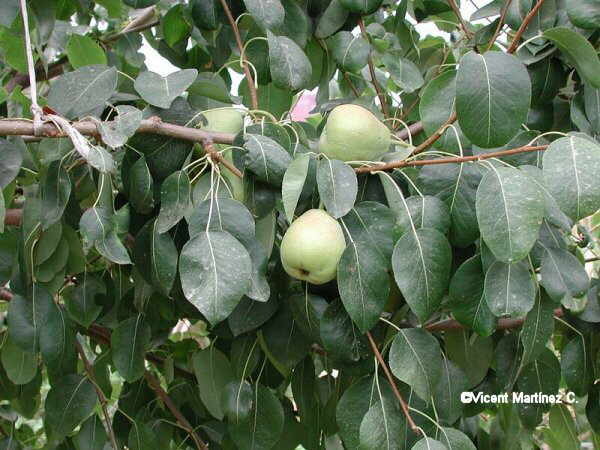 It seems it is a species it is a species coming from the species Pyrus nivalis and Pyrus caucàsica. It was first cultivated in East Europe and West Asia.